Summer is officially here, so it’s time for another salad, this time a bit heartier. This recipe is also inspired by a salad offered at one of our favorite GR restaurants, The Winchester. At the restaurant, the salad is served topped with a skewer of lamb kafta and drizzled with a cucumber-yogurt sauce. I wanted something that would last in the fridge a few days, so I incorporated the sauce into the rest of the salad. I’ve been eating it as-is out of the fridge all weekend, and it’s still just as good as the day I made it. It’s a great hearty summer salad–fresh tasting, and filling without being too heavy. Something a little different than the same ol’ macaroni salad doused in mayonnaise. The important thing to remember when preparing the vegetables for this salad is to dice the onions and peppers very small, so that they are not much bigger than the barley. It makes for a much more pleasant eating experience. Combine barley, olive oil, peppers, and onions in a medium sized bowl. Set aside while preparing dressing. To make dressing, blend 1/2 cup yogurt, herbs, and cucumber in a blender or food processor. Gently stir cucumber mixture into the remaining 1/2 cup yogurt. Stir yogurt dressing into barley mixture. Salad can be served immediately or chilled overnight. Salad will keep for 3 days in the refrigerator. This recipe was inspired by a salad that my husband got last weekend when we were out to eat. 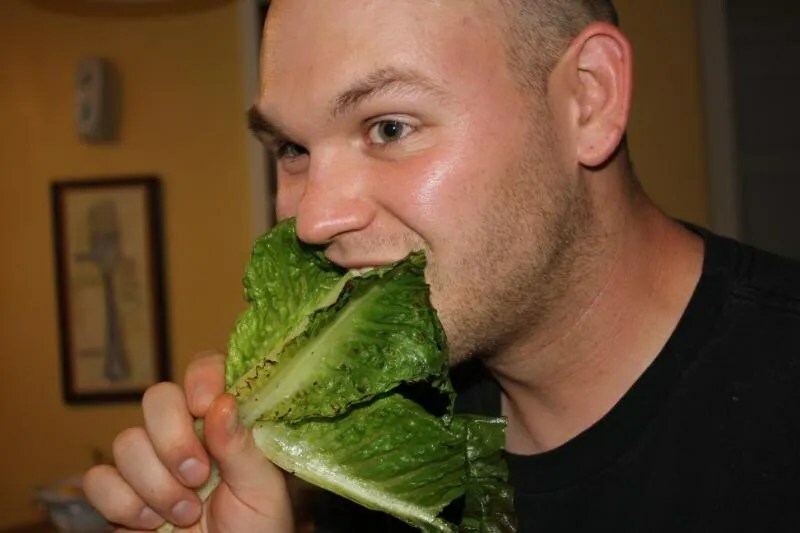 He was amazed at the fact that it is possible to successfully grill lettuce. I took it as a challenge, and decided to give it a try myself. Next time I will invest in some better cheese, some crusty bread, and maybe even some homemade dressing. I played it safe this time and used cheaper accompaniments in case something got messed up in the grilling process. Overall, this was one of the easiest dinners I’ve made ever, with some of the best results for time and effort spent in prep. Sorry, I don’t have exact measurements — but they really aren’t needed here. I took three hearts of romaine, split them lengthwise, washed them, and patted dry with paper towel. Then I made up some garlic oil by grating 3-4 cloves of garlic with my microplane, and adding about 3 tablespoons of olive oil. To that I added some cracked black pepper, and then brushed the oil liberally on the cut lettuce halves, making sure to get plenty of the garlic inside the leaves as well. 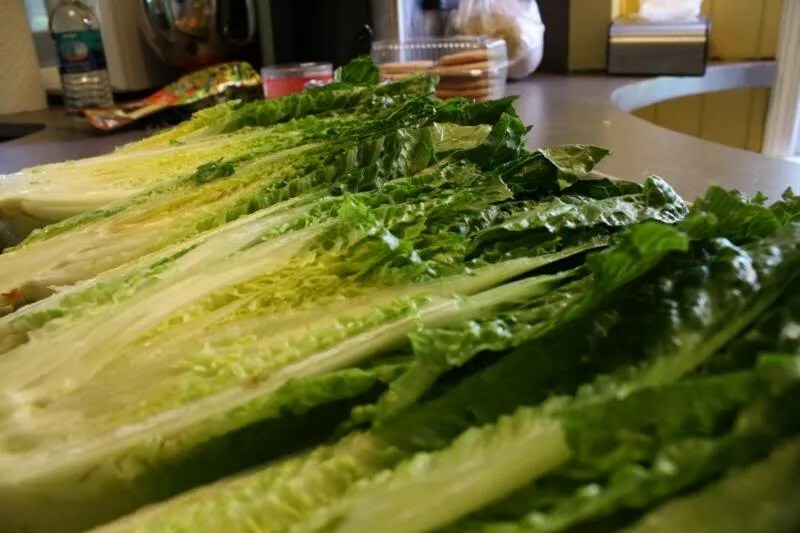 Romaine lettuce halves, before brushing with oil. I then placed the oiled lettuce halves on the flaming hot grill (as high as it would go) and let them cook for about 2 minutes uncovered. Just enough for the cut edges to get a slight char on them. Any longer, and you’d have a soggy, wilted mess. 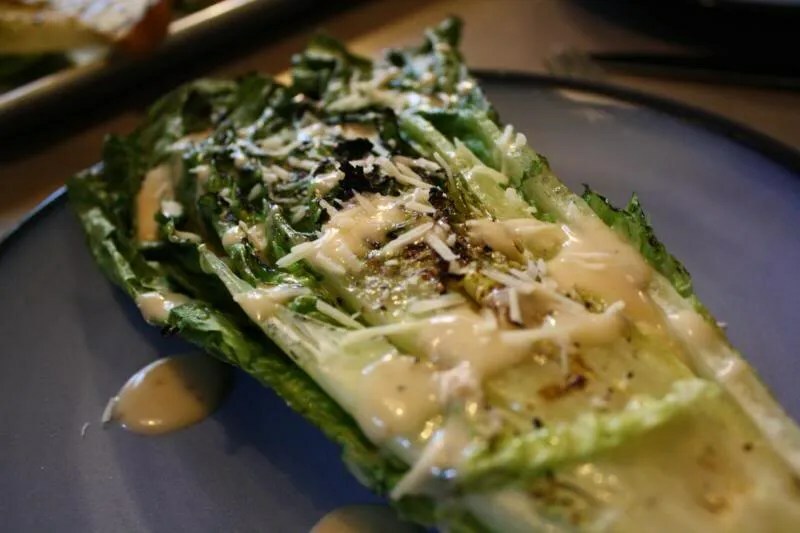 I sprinkled the grilled lettuce with flaked sea salt for some added crunch, and served with bottled dressing and parmesan cheese. Grilled lettuce topped with flaked sea salt. Mmmm good enough to be dinner on its own.